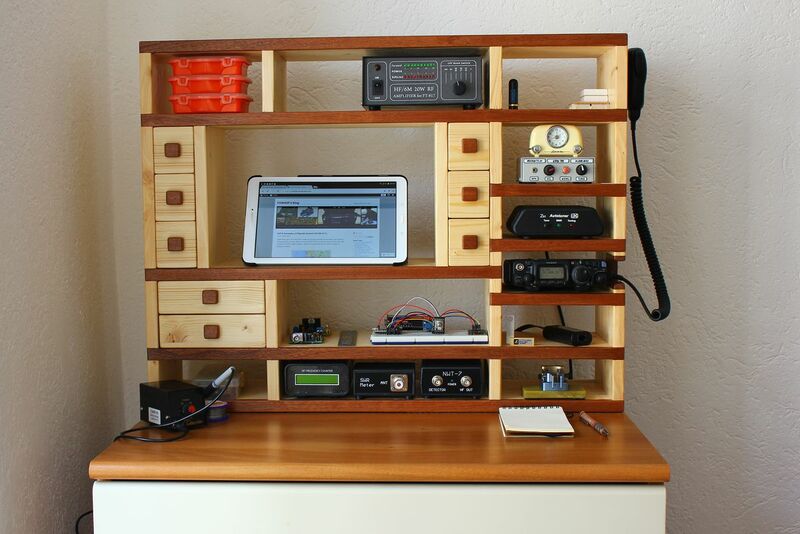 Somehow I wanted to combine my other hobby, woodworking, with ham radio, and the best thing that I came with is this radio shack. 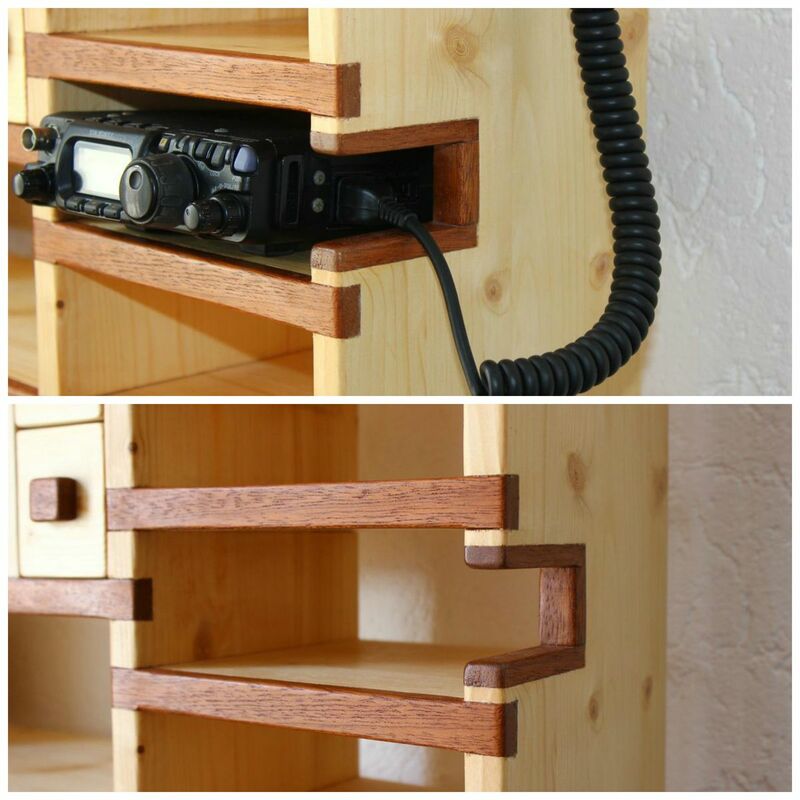 The entire design concept is formed around the FT-817 and its accessories, a space for a small shack PC for logging and various interfaces, and some future equipment that I would like to accommodate. 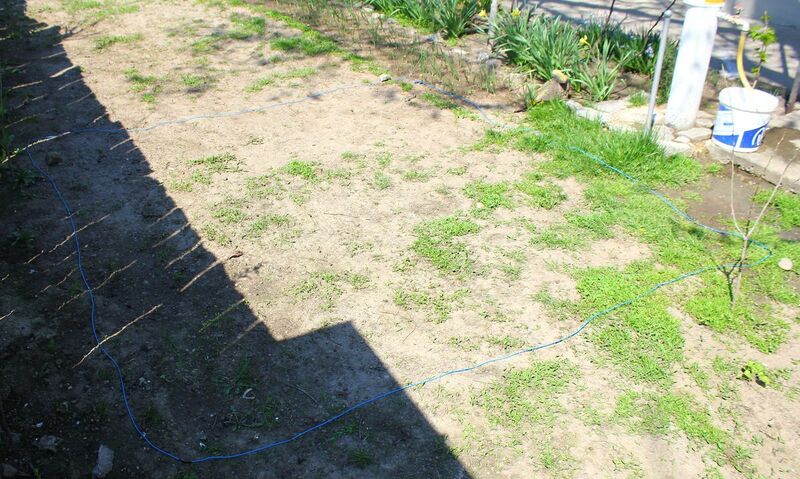 Practically, almost every space there is or will be assigned to something particular. Dimensions are 700 mm length, 550 mm height and 170 mm depth. The body is made out of laminated pine boards, 18 mm tick, available almost in every hardware store around Europe at least. Some stores even cut your boards to your desired dimensions, so I did to save some time and dust in the house…The horizontal front edges are mahogany strips of 20 x 10 mm found in a store here in Trieste. Gives a better aspect and contrast to the rack. And the finish is an acrylic glossy transparent varnish. For the microphone cord I’ve made this cutout to get it out. It is long enough to plug also the headphones jack. 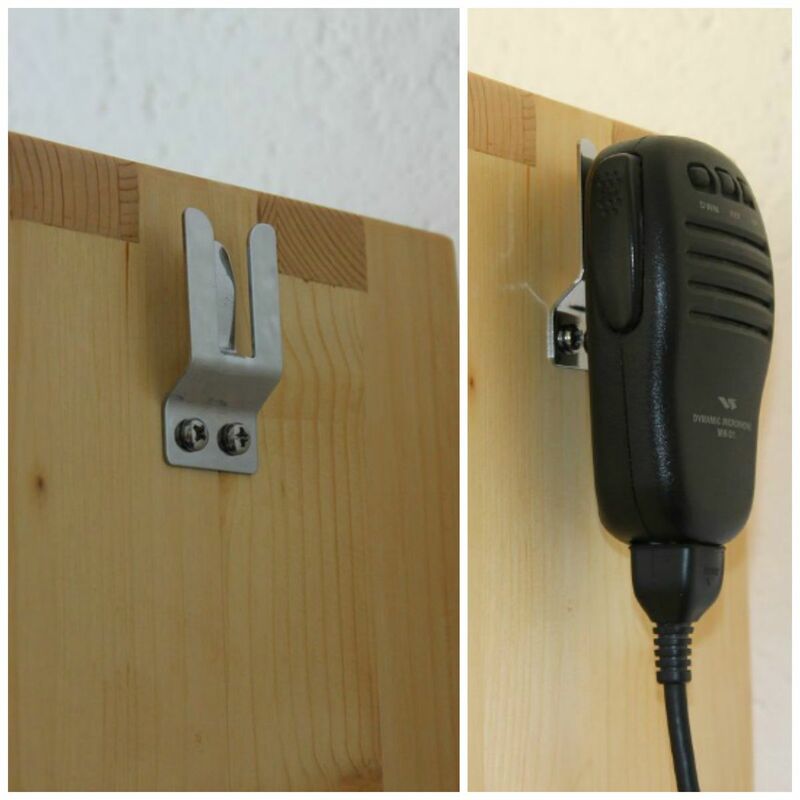 Finally I have somewhere to use this microphone hanger that came with the transceiver. It was fun building it, many hours after work of sawing, chiseling and sanding…a lot of sanding, but I am very pleased with the result. 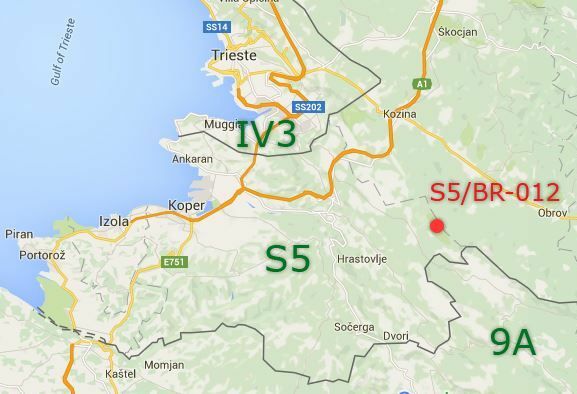 Some days ago, on 25.06.2016, I went to Slavnik summit in Slovenia, very close to Trieste, about an hour drive, to try my first SOTA activation here in this area. 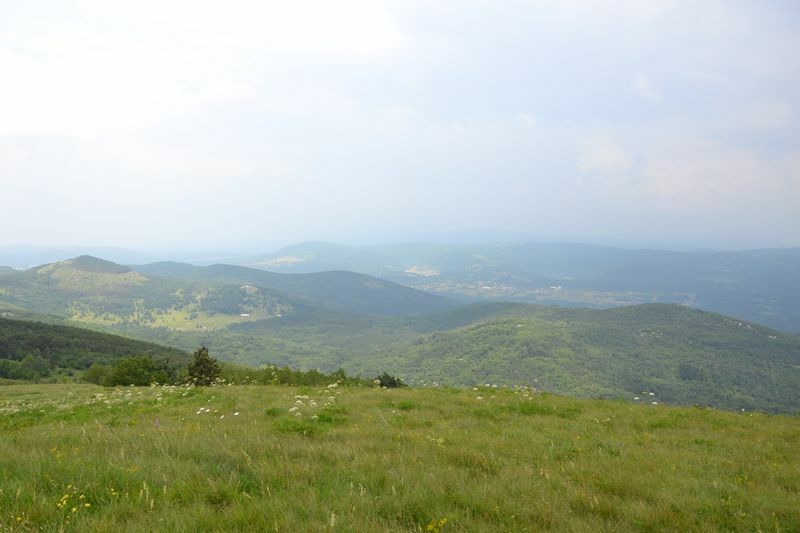 The summit is 1028 m high, 4 points, and it is located nearby the small village of Podgorje, Koper. The actual climbing to the mountain took about 2 hours, tourist tracks starting from the village at about 500 m altitude up to 1028 m. The view from up there worth the effort getting here, you can see all the coast line of the northern Istria peninsula and the cities of Piran, Koper and Trieste. My thought initially was to arrive there before midday to catch some activity on 20 m before King of Spain SSB contest, but this never happened, and I arrived couple of minutes after 1300 local time. 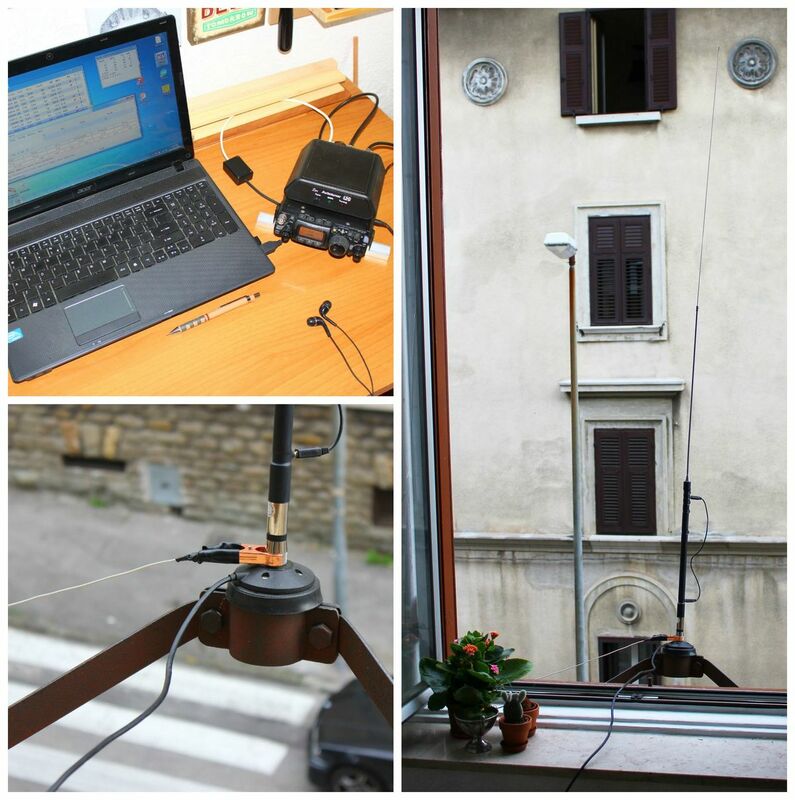 I installed the fishpole, with three anchors right close to the summit post, 5m wire vertical antenna with same length radial for 20m, wired up the equipment, FT-817 and a 7Ah SLA battery, and start CQing. 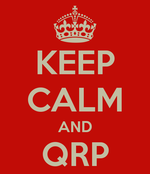 Barely managed to make 2 QSO and the band started to get busy with the contest, where I’ve made also a couple of QSOs. After a while I moved to 17 m band for a few more connections and then I saw a rain approaching and start packing. I was a little disappointed because the rain stopped couple minutes later after we left, but decided not to return, at least I was happy I’ve tested the ground around here and wish to return for other nearby SOTA summits. 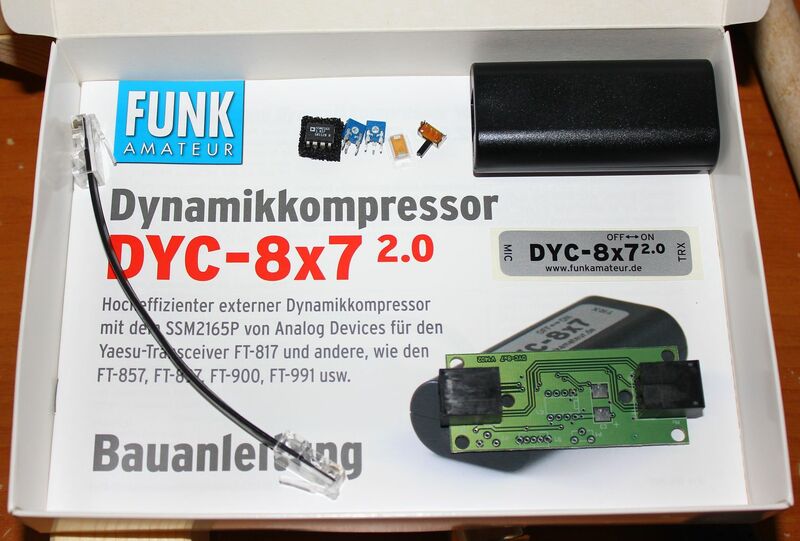 One addition for the FT-817 that I should have added for a long time, arrived today from Box 73, the online shop of the german ham radio magazine, Funkamateur. It is a microphone compressor based on the SSM2165 chip, housed in a handy enclosure and plugged between the transceiver and the microphone. Kit details can be found in this description from their website, both in german and english. The online shop is only german, but very intuitive to use even for non german speaking users like me. In my emails to them confirming the payment they were actually so kind to translate based on the shipping country I selected, but the text was in portuguese. Funny… A romanian living in Italy and speaking portugese with germans. The kit comes with the SMD components already soldered, the only things to mount are the SSM2165, two pots, RJ connectors, a tantalum cap and a switch. I will give it a try soon these days and see what it can do. This weekend I worked for the first time from my location here in Trieste, and what could have been a greater test then the WPX Contest. Guiding myself by the “any antenna is better than no antenna” motto, I used my mobile HF base loading whip, Proxel PRO-X1, mount it on the flag support just with the magnetic base, and hanged only one 5m radial along the building. The radio setup was usual, FT-817, Z817 tuner and N1MM for looging and CW sending with this simple interface I built some time ago. Didn’t had to much expectations, but for a couple of hours on both Saturday and Sunday afternoons-evenings, I was able to make 70 contacts from 40 to 10m with this modest setup, all EU stations, from every corner of the continent. P3, Cyprus, is to close to consider a DX. Two things that I could improve slightly to the antenna is to add some more radials, I might have room for 2 or 3, and try to use it at different inclinations. Now is at 70-80 degrees, and seems too close to the wall. Curious how will perform from 45 to horizontal. 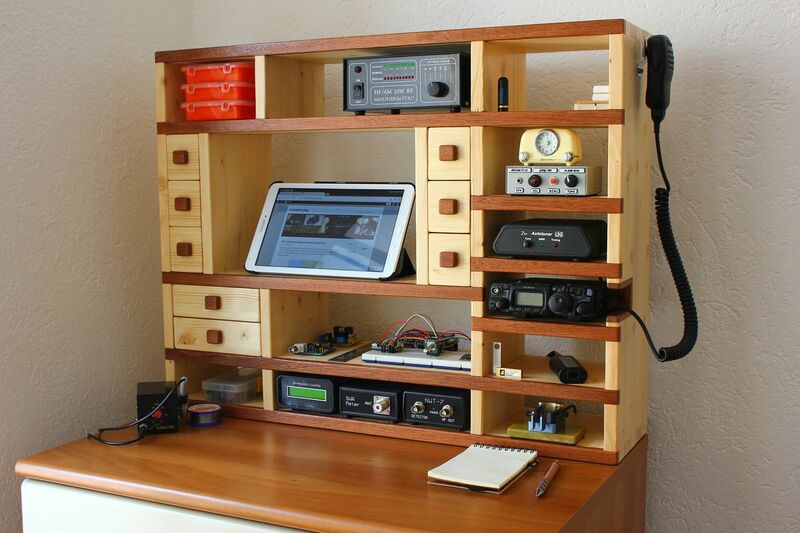 In the past months since my last post here I was off from any hobbies, radio or electronics projects, just a day on my summer holiday at Hamradio Friedrichshafen, which sadly I haven’t wrote anything, only a photo album made. 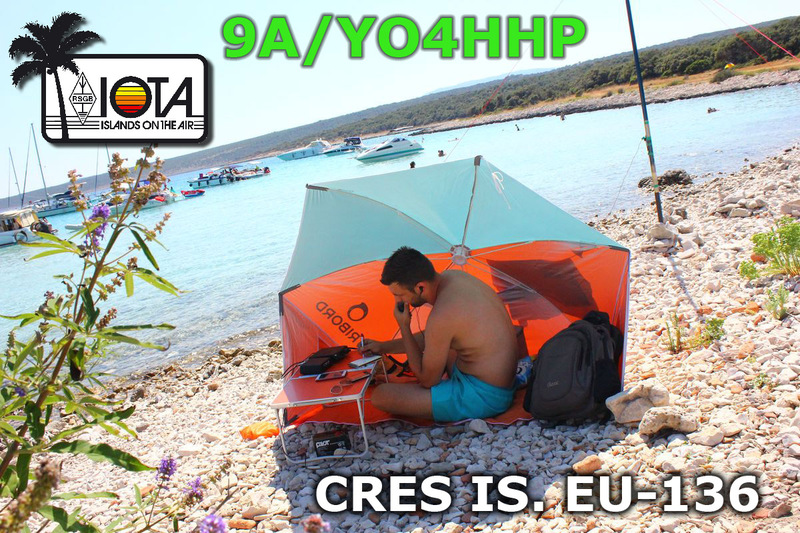 Well, from now on, at least for the next two years, I will be operating as IV3/YO4HHP/P and who knows, maybe with a full Italian callsign in the near future. 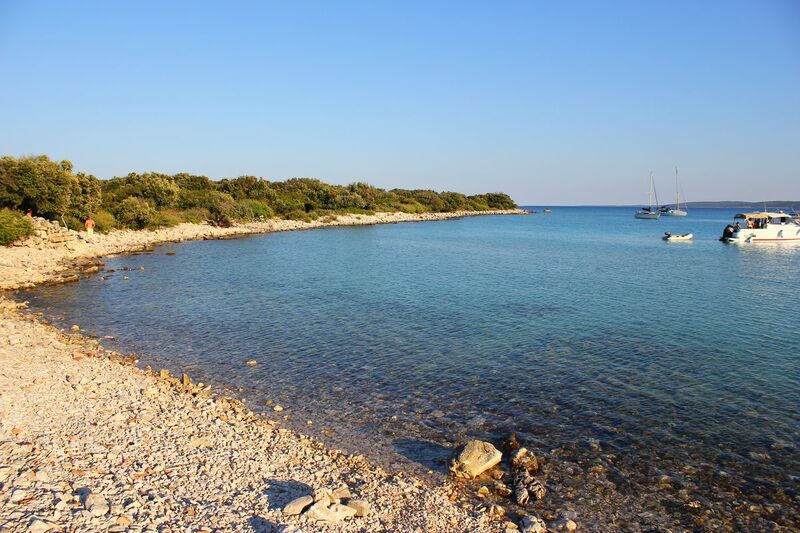 I have been transferred with the job within our company group here in Trieste, in the North-Eastern part of Italy. 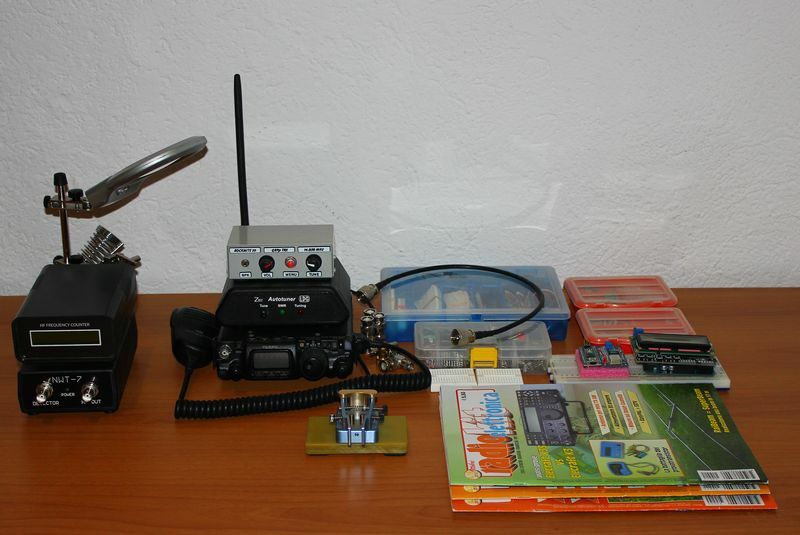 I couldn’t stay away from the radio virus, so I carried out with me on the plane the FT-817 with its accessories, a few Arduino modules to experiment, some home made RF measurement equipment, and an assortment of components, SMD, ICs, toroids etc. Unfortunately no tools, just a tiny plier and a screwdriver, so I have to get new ones from here. Luckly for me, the owner of the apartment I rented here is a big football fan and he used to hang his team flag outside, so I have inherited this useful flag support to use it, of course, as an antenna support. I was thinking about the MP-1 Super Antenna will fit best here. Meanwhile, I will just hang some wires to this BNC-Banana adapter for fun and checking out the bands on Rx. I have already identified some ham radio activity here, saw a few YAGI beams on some buildings, there is also a radioclub in the city, 9A and S5 are very near, meaning a lot of SOTA, WFF, IOTA posibilities, so no excuses to waste time! 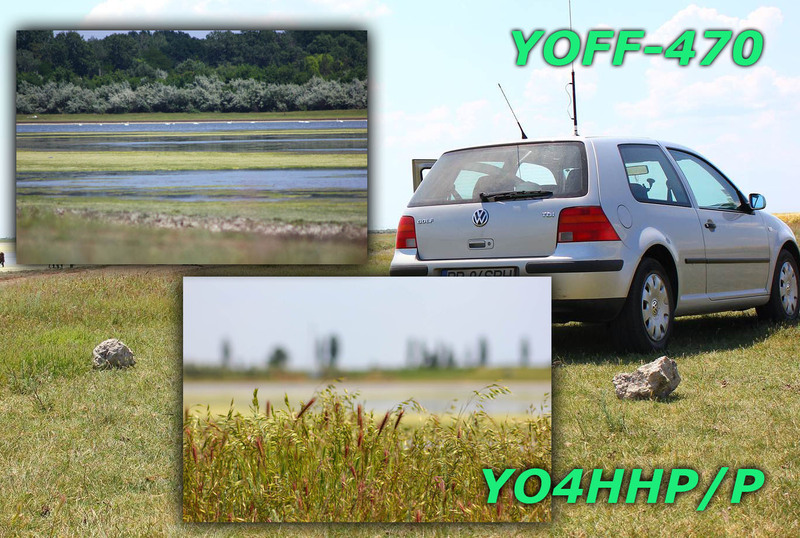 Today, taking advantage of the national free day I drove to a nearby location, about 10 km South of my QTH, into a WFF zone, Lacu Sarat (Salt Lake) Braila. This lake is splitted into two by a small road, the first lake is a touristic resort, with therapeutic salt mud, and the second is part of a Flora and Fauna zone, YOFF-470. I stayed there not more then one hour and worked about 45 contacts on 20 m band with the PRO-X1 mobile antenna and 5 W power from my FT-817. Well, its been a while since I started this project and I see that many folks are visiting my first post, so here is an update of what I did lately with this amplifier. I short words first, I put the board all together, set the bias current, attached a heatsink, built LPF board and did about half of the mechanical construction on the enclosure. Most of the time my amp stood on the shelf dismantled because I couldn’t manage to find a reasonable 1 or 2 Amps scale ammeter to measure the bias current. Most of the cheapo multimeters have 2 mA, 20 mA, 200 mA and then suddenly 10 or 20A scale and I wasn’t feeling confident measuring the 2 x 300mA with it. 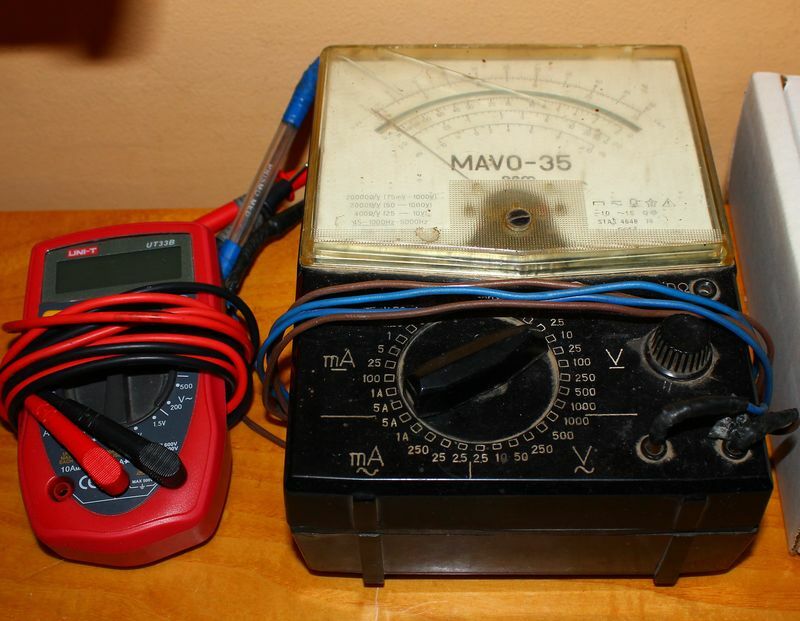 Luckily, a few weeks ago I was able to put my hands on this Romanian old school “piece of art” multimeter, called MAVO-35, which can measure 1 and 5A DC current. So, after I finish assembling the board, MOS-FETs attached to the heatsink, 50 ohms dummy loads on both input and output, I have set up the currents to 300 mA each side. With the pots turned full CCW the board only drawed 50mA, so now with the bias set it, the total current consumption in stand-by is 650 mA. Instructions can be found also on Kees, K5BCQ, website. I see now that Kees has a new version of the amp. Main difference is that he replaced the two output binoculars BN43-202 with one single transformer. 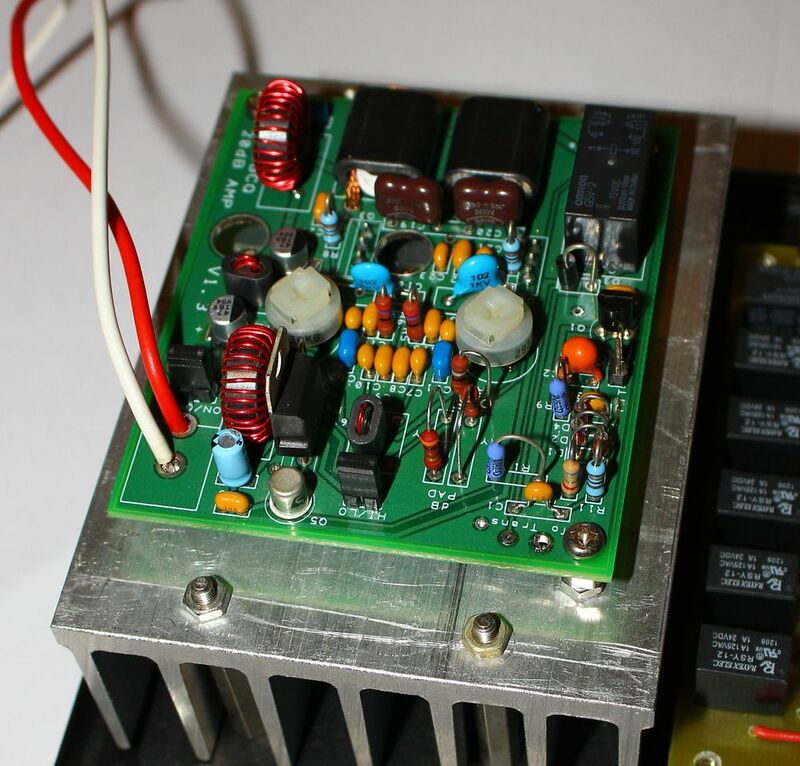 He says the first version was getting to hot at 20W, so I will probably get the same issue…Anyway, now he published the schematic of the amp on his website, so go check it out. 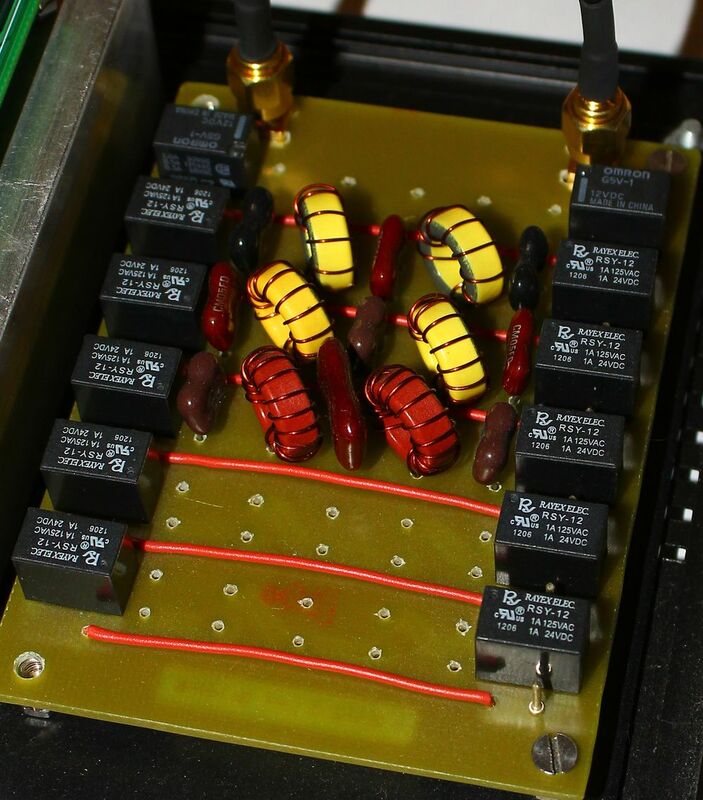 This is a first version of the Low Pass Filters board. 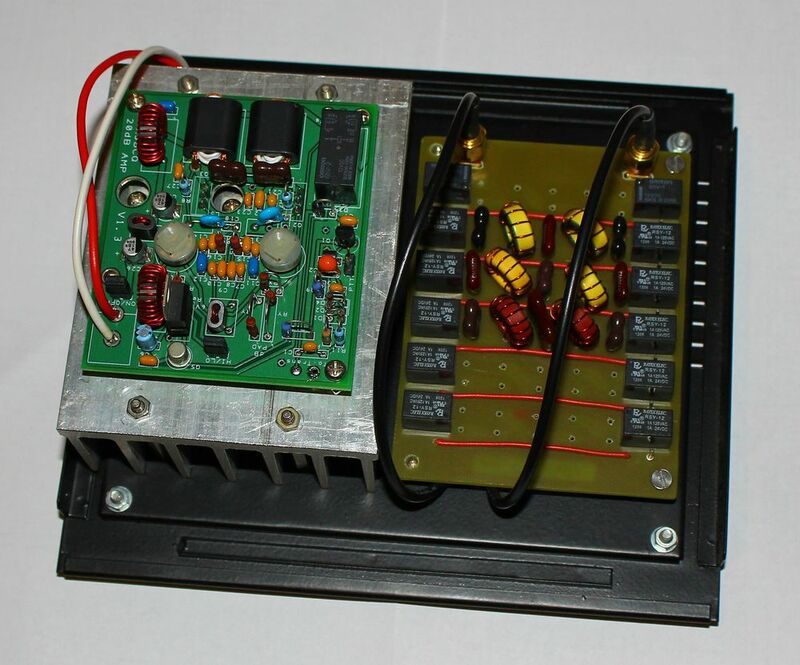 It is a six filters unit, with five poles, switched by Omrom G5V1-12 type relays. They are initially designed for 160m, 80m, 40-30m, 20-17m, 15-10m and 6m. Here in the picture are missing the 160, 80 and 6m filters. I got the silver-mica caps also from Kees, ordered separately. For the missing slots, I couldn’t find the necessary values yet. 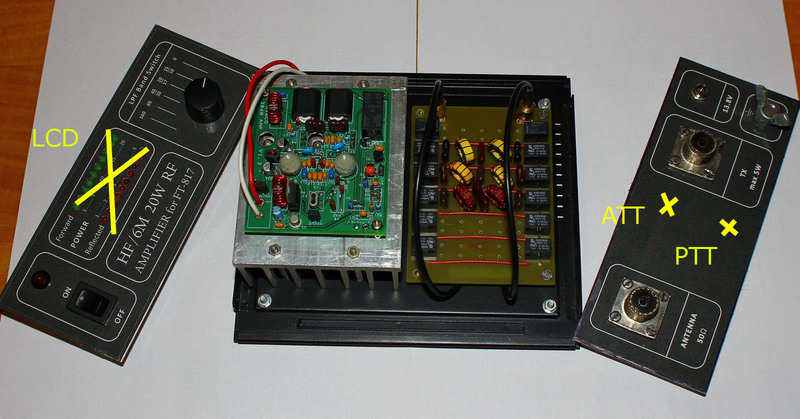 After the RF tests I will publish also the PCB layout and the schematic. 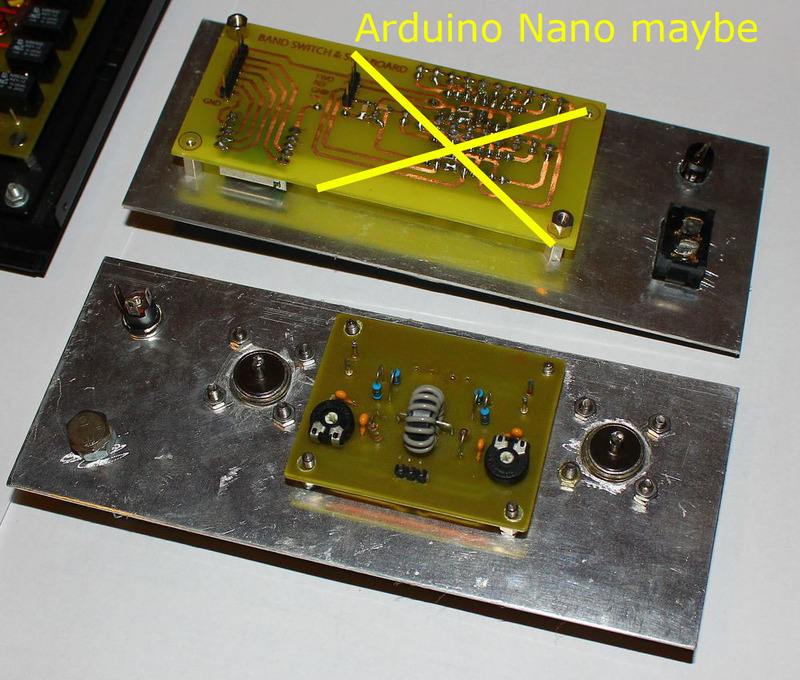 I still have to follow if is this board will work properly, in terms of heat dissipation, RF loss etc. As you can see I have used Amidon T50-2 for the lower bands and T50-6 toroids for the higher ones. These are the initial panels but I will change their actual design. I have made them a long time ago, but since then a lot of ideas came and gone away. To my first design I have added LED power and swr meters with LM3914, as you can see down bellow. Later on I did a separate stand-alone SWR meter, and this days I have in mind to add a small LCD, 8×2 characters maybe, or an old Nokia graphic display driven by an Arduino Nano. Same to the back panel. In my first design I actually forgot to add a PTT socket. Even if the amp has a SOX circuit, it is better to have this one also. And, optional, if can be done, I will add an attenuator switch, to toggle between 1 and 2.5W input, or 1 and 5W. The SWR bridge is a kits-and-parts.com model. One of the toroids is missing in the picture. It is used in the other SWR meter. To this last additions, LCD, ATT etc, I will concentrate later. Now the next step is to put some RF signal to the board and see how it works. Hope to do this soon and keep you up to date. 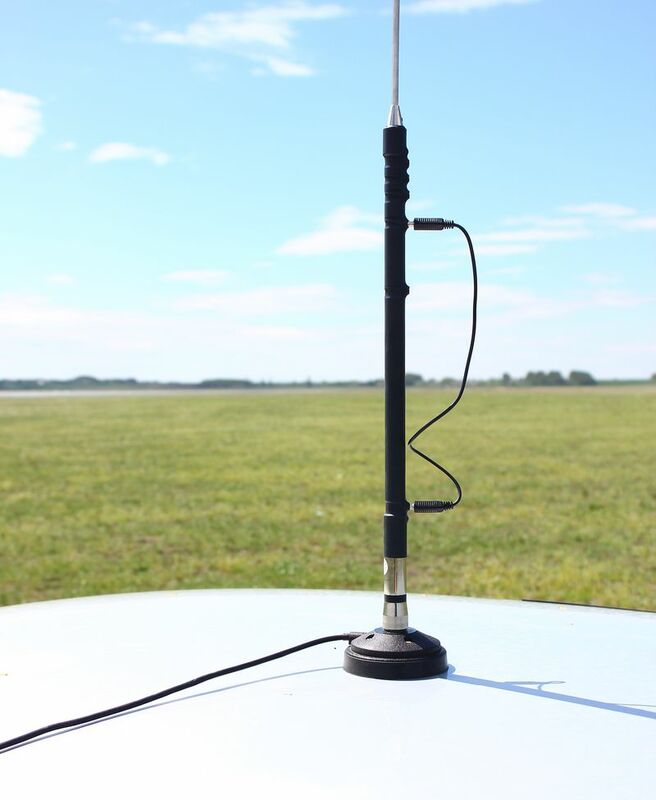 Last weekend I did some mobile antennas experiments on the field. I have in my shack two of them, one “don’t remember brand” dual band VHF/UHF and one HF antenna, Proxel PRO-X1, which I never use them before. The PRO-X1 is the italian version of the MFJ-1699 and the australian Outbacker. It consist of 2 parts whip, one fixed and one collapsible on a certain height regarding the band, and a multi tap base loading coil. Total height goes to about 184 cm. 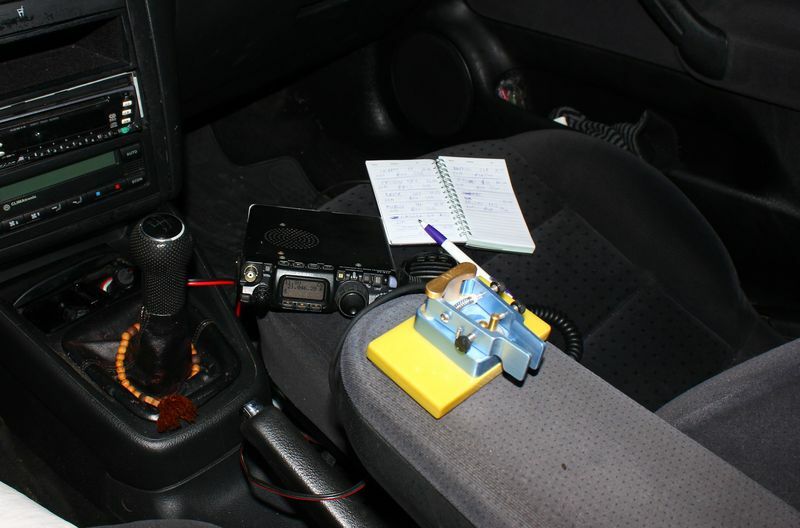 So, on Saturday late afternoon I have set up my car, installed the antenna, put the whip to max length, taped to 20M band, wired the FT-817, its “super” SWR meter looked good and made the first try. 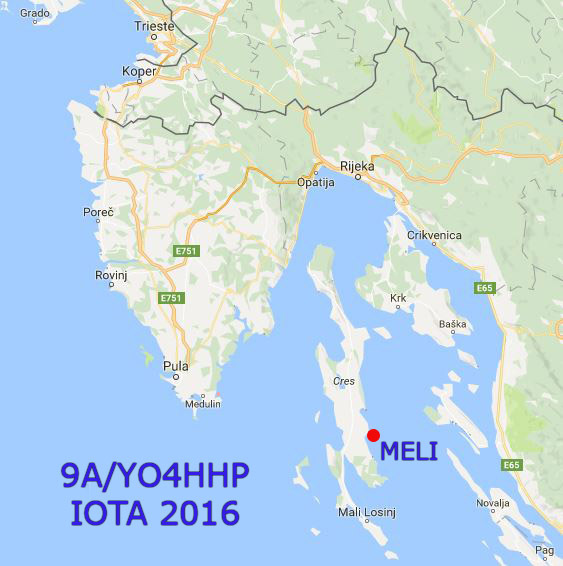 First contact was a Cretan station on SSB. 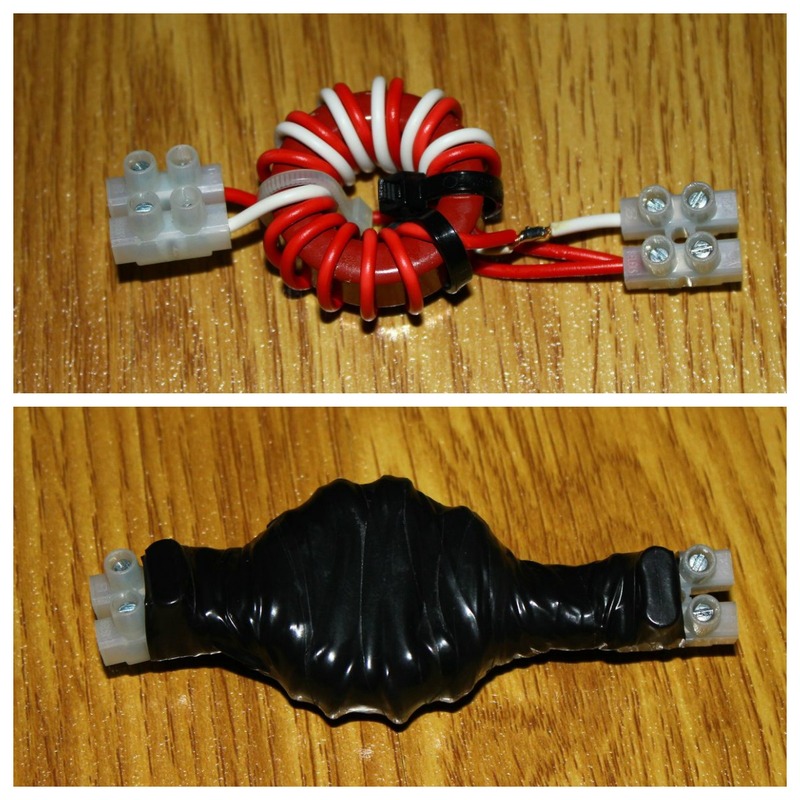 I was surprised it worked with that tiny stick and 5W! Later on I began working in ARI DX Contest. 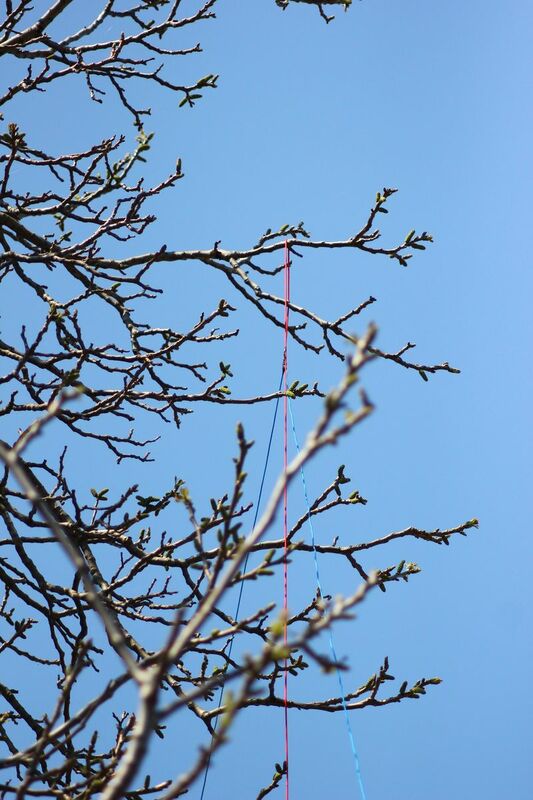 In the next hour I was at about 20 QSOs on 20M, both SSB and CW, all European stations, but more easily worked then with my cherry tree dipole. I then switched to 15M band, just changing the tap, no whip adjustment. Same, the “ultimate” SWR meter of the FT-817 looked ok. After two contacts, the big one came. I was hearing PY5QW on SSB, called him once and for my surprise he came back with my full callsign copied. Didn’t believe it, 11000 km from Brazil with 1.5 m antenna and 5W/SSB. Ok, then I cheked his QRZ page and saw his antennas… Next was a new country for me, GU, Guernsey Island. Totally, in about two-three hours I have made over 40 contacts in the contest. Next day I went to a nearby location and activated the YOFF-203 zone in World Flora and Fauna Program. A group of salt lakes near Balta Alba village. In about 30 minutes I have managed to make about 47 contacts on 20M SSB with the HF mobile antenna. 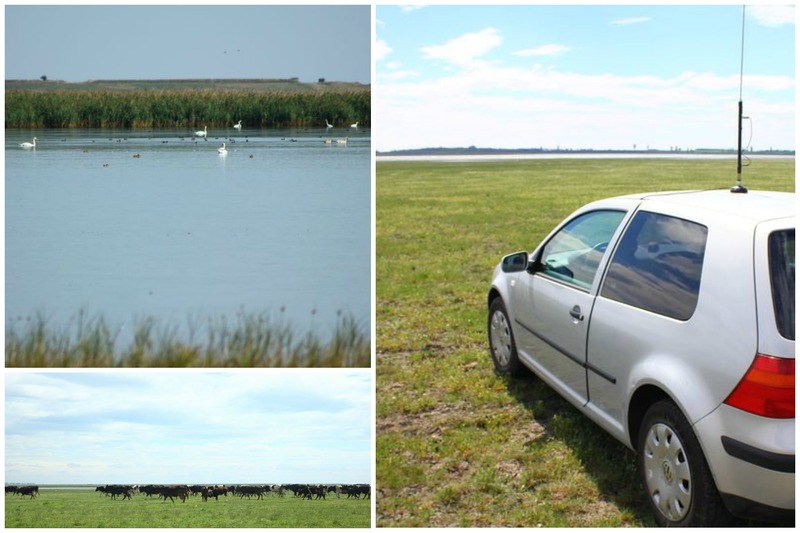 I took advantage of the small Easter vacation last weeks and installed two HF antennas at our countryside place, 10 km away from the city, where I spent most of the summer weekends. 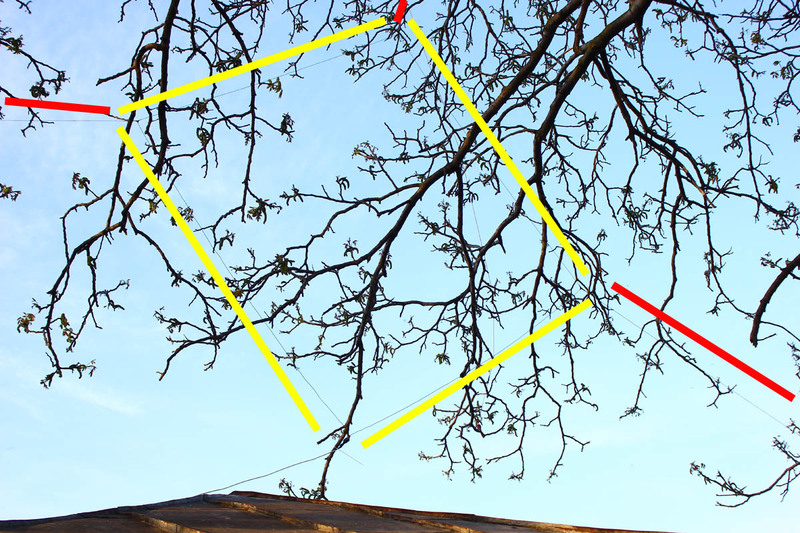 Like every spring, I reinstall my wire antennas in the big old cherry tree just before the leafs start to grow and make this job difficult. Except adding some masts, I cannot install hinged antennas in the courtyard other then the trees. Dipole for 20M band. 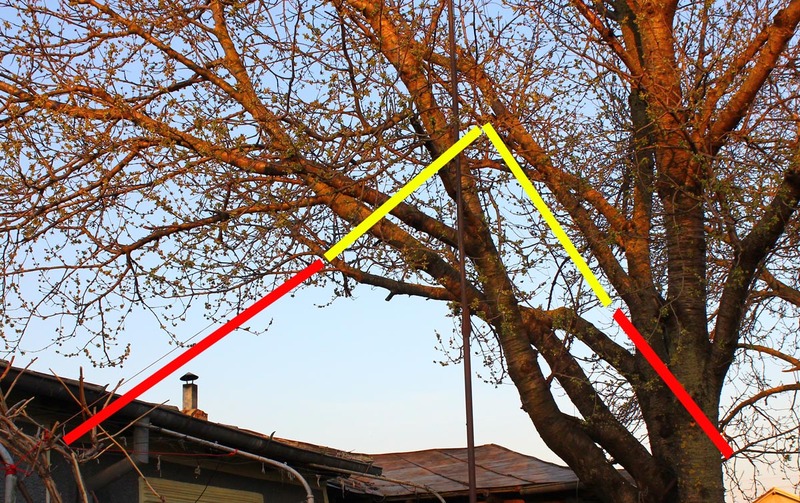 A 2 x 5 m Inverted V, with feed point at about 7-8 meters high. 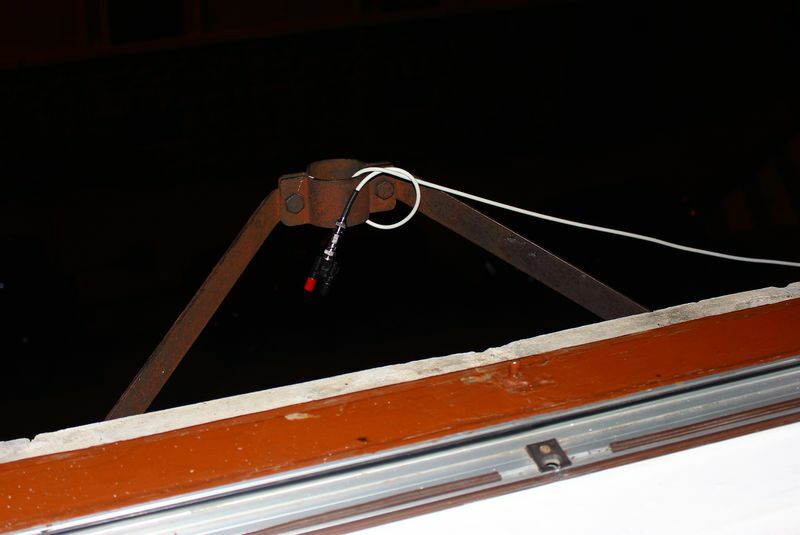 I made this antenna first time in the same location two years ago. Worked fine JA and K with 5W. Last year I did a butterfly dipole, adding also a 2 x 10m of wire for the 40m band. I wasn’t very satisfied on 40, not so spectacular DXs. On 20 and 15, on the other hand I made my first South American contacts. Don’t know if the extra 2 x 10 m counted to much, but this year I decided not to add it anymore. From the remaining wire I took one side of 10 m long and made this quad loop, vertical mounted, for the 10 M band. Each side is equal, aprox. 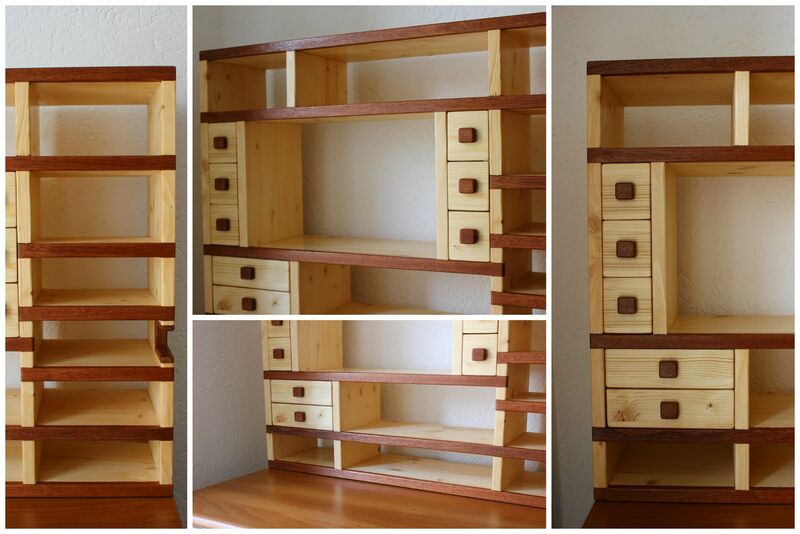 2.5 m each, hinged from a walnut tree. Normally a quad loop has 100 ohms impedance, so I made a 2:1 balun. I could have live with that, and made the LDG Z-817 tuner do the job, but at my FT-817 having the extra BNC socket in the front panel I wanted to easily switch between the dipole (connected with Z817) and the Quad Loop (already tuned). I used an Amidon T130-2 toroid for the balun, and wired, like in the diagram below, 6+6+6 wounds. Didn’t made any fancy box for it, just wrapped insulating tape all around. Here is the loop being measured and marked the corners before putting it to its place in the tree. Now waiting for the 10M season to arrive. Didn’t made any QSO yet with it, just a comparison when receiving between this and the dipole. The difference is quite remarkable. More noise silence and more gain, although in theory I found out that a vertical loop has about 1.2 dB gain over a dipole.